Tags: New, Fundamentals, Research, Group, A', Design, award, mobius, sofa, generelli, sa. We are pleased to announce that New Fundamentals Research Group with Generelli SA win the Golden A' Design Award 2017 in the category 'Furniture, Decorative Items and Homeware' with the project 'Mobius Sofa'. A' Design Award and Competition is the worlds' largest design competition awarding best designs, design concepts and products & services. 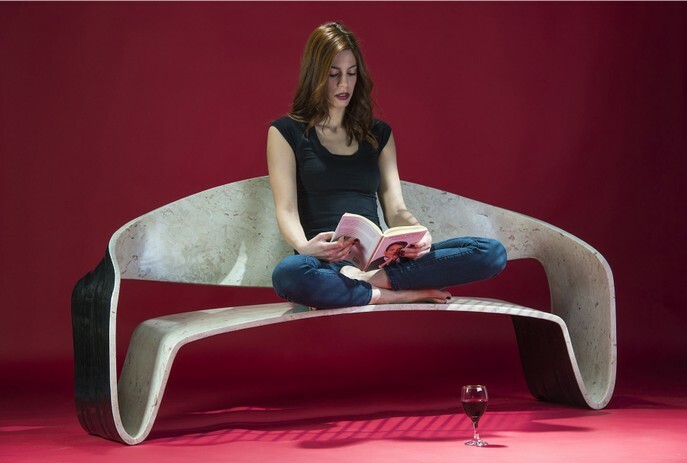 Mobius Sofa is inspired by the famous Mobius strip that is a surface with only one side and only one boundary. It can be realized as a ruled surface. It was discovered independently by the German mathematicians August Ferdinand Mobius and Johann Benedict Listing in 1858. The project rappresents the state-of-the-art of research into stone materials and manufacturing techniques. 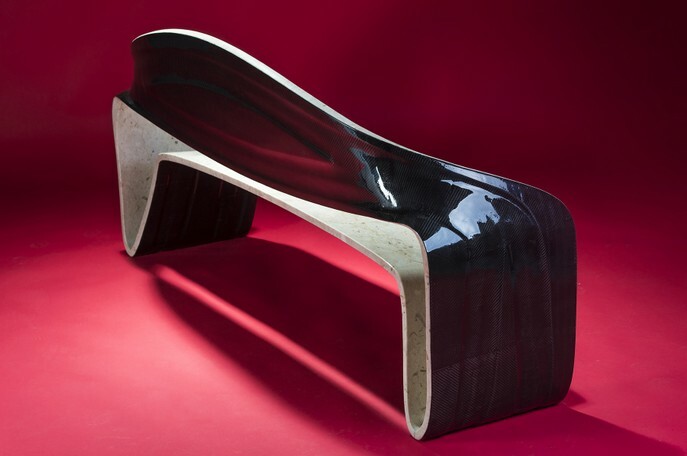 The seat is configured as continuous 2 centimetres thick bands of Perlato di Sicilia, reinforced by applying a layer of carbon fibre on the back. The bands are made up by assembling a few lightweight pieces manufactured using CNC machinery. 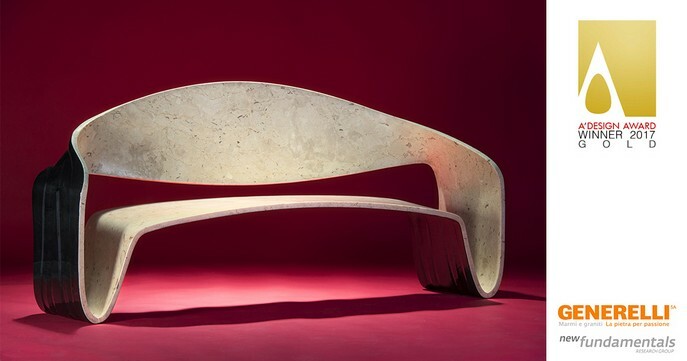 Their form emphasises the enormous unexplored potential of stone as a contemporary material for industrial design. The project started in December 2015 in Bari (Italy) and Rivera (Switzerland) and finished in September 2016 in Rivera, and was exhibited in Marmomacc Verona in Octorber 2016. The fabrication of the parts that forms the sofa consists of the following steps: 1. A solid block containing the whole piece is taken on the horizontal plane; 2. The block is moulded until the complete milling of the backside of the panel; 3. The milled surface is reinforced by carbon fibre or glass fibre which are glued through vacuum bagging technique; 4. The fibre-reinforced block is rotated and milled on the other side, until the panel desired thickness is achieved; 5. All the parts are glued togheter; 6. The stone and the carbon fibre are polished. 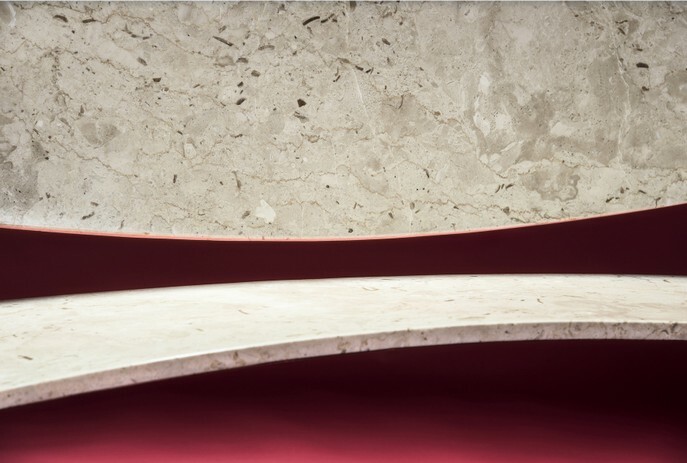 The research aims to investigate the architectural uses of free-form panels made of natural stone, reinforced through the use of carbon fiber (or glass fiber) sheets on the back, in order to build lightweight shells in granite or marble. The combination of these two materials allows reducing the thickness of the stone components up to few millimetres and the achievement of a great structural performance. The project is a collaboration between the New Fundamentals Research Group (from Polytechnic University of Bari) and the Ticino-based company, Generelli SA.